OK, I got permission to disclose some info. I am hoping for community support on this one as this will be first crypto with anon cash ability. By crowd funding this, anybody with BTCD can help to achieve a crypto first. I would applaud such an option, but there is no way that "a bank card" would be accepted in an ATM in the Netherlands. It would have to be a card on the Cirrus/Maestro (or one of the major CC companies) network to be accepted at most ATM's. Clearly, it wont work in 100% of ATM's worldwide, the goal of course is maximum coverage. Now my understanding is that you can use a mastercard debit card in pretty much any ATM in world, with some exceptions. I dont think it matters which company is issuing the card as long as they are part of the global payments network. I've noticed a pattern with the price which i've been monitoring for a few days. I will post more details later when I can hopefully conclude the additional info. heh yea im currently working on using opengamma on crypto exchanges, need better margining and analysis tools heh. I was asked to help with kickstarting the marketing side of this project. I am already involved in Nxt (for 8 months) and I am starting with the CryptoNote technology, so this is why it was logical to add BTCD, since these 3 projects are going to work together. Devs told me to publish the plans, but this isn't my nature, since I am not a pre-announcer or pump-dumper. All marketing stuff will be created with the long-term goals. No lies, no hypes, just facts, presented in some nicer form. I'd just like to mention that Salsacz is coming on board to handle media relations. He was responsible for that great coinsource article, which seemed to be the spark in getting us a lot more attention. I'm really looking forward to seeing what he can do. So get ready for a lot more press coverage! some silly bot floods the orderbook with 1 BTCD sells so people cant see what is really on the books. If people want to sell now, let them sell. Yes price has gone up a lot, but remember it used to have a total market cap of 100 BTC, so really it couldnt help but go up. I told everyone that $1 million market cap was pretty much certain. I was right. Some people say a coin is worth $1 million per developer. So on that basis, we are currently undervalued. I would like to think that I count for one developer and then there are the other BTCD devs. Anyway, the way to increase BTCD value is to create new features, like anon card and of course all the tech. Until we get some actual new functions, I think BTCD price should stay around the .002 level. Going up in value too fast is not sustainable. Also, I need a bit more than 72 hours to get stuff done! Now similar to my prediction that BTCD will be worth $1 million (when it was worth $100,000) I predict that BTCD will become a top 10 coin on coinmarketcap. However, this wont happen until most people are believing in the promised features being delivered. BTCD is kind of in the position NXT was last November. It was actually running, but not really any features until aliases came out. But there were a lot of promised features. As each feature came out, the price went up in a big step, but actually the price can go up when a feature is believed to be just a matter of time, eg. if its on testnet and looking good. So, I am not promising anything crazy like 1000x gain that NXT got the early investors. I cant even promise another 10x as I do make mistakes in my predictions on occasion. However, getting to $10 million marketcap is not really such a crazy prediction considering all the tech that I will deliver. That is one thing I can promise, I will deliver the tech. It will have some bugs at first, but that is why we test! I am good at coding and fixing bugs, so as long as there will be testers to test the software that I WILL deliver, then BTCD will get the promised features and achieve the ~$10 million marketcap. 2. With InstantDEX and enough orderbook depth: BTCD -> BTC bridge, this is relatively easy to do and I believe gives a lot of value as BTCD is effectively accepted by all merchants that accept BTC. 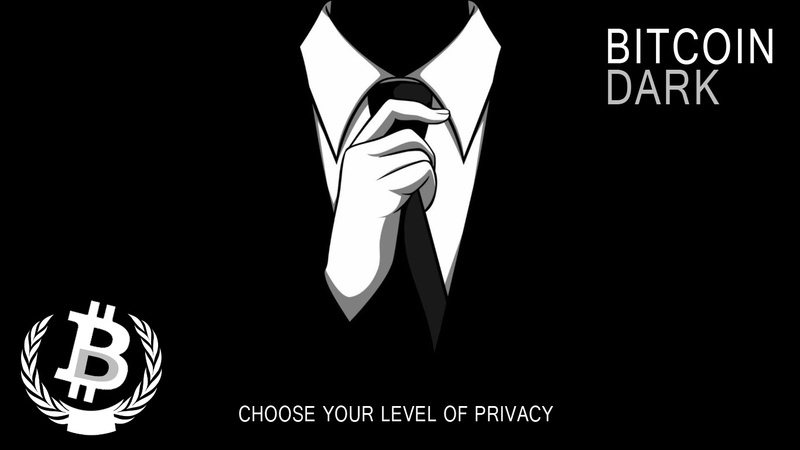 All of the above is built on the privacyServers, which can be some, most or all of the BTCD nodes, though you need to run a 64bit OS to run privacyServer. P.S. I do feel that BTCD is getting some attention from competitors and maybe they are doing some volatility games to scare people away. If you start feeling some fears, just read my roadmap list, maybe that will help. HODL! We've just released PocketCrypto, a new Cryptocurrency Management App that will allow you to easily manage your BitcoinDark investment. Hope you guys will check out the app and Good Luck to All! I am working on a non-tech project that relates to BTCD, but it is about a month out, so not sure if there is any point to post about it. However, it needs some funding and so I am hoping that we can crowd fund it. This wont be like a donation (even though it is quite worthy cause! ), I will issue a NXT asset and then people who own the asset would get a percentage of revenues. I know it is impossible to decide on how much to fund without more details, but I would like to gauge the level of interest. This is a chance for BTCD holders to help by investing in an asset that will directly help BTCD and also provide dividends. It probably needs around 30,000 BTCD worth of funding, still working on exact budgets, etc. So, if the concept is something you like and find promising, how many people will purchase asset to crowdfund this? Agreed. We need to set up community BTCD development fund. I think a great idea would be to utilize the soon to be released multi-sig functions. For example, bounty rewards would be sent to a single address, however it would require 3 signatures in order for the bounty reward to be released. I think this would be an awesome way to promote our new features and at the same time help to strengthen trust and also to serve as a form of quality control over bounty projects, because not one single person would be involved in the decision to release the funds. @James How feasible would it be to have a BTCD development fund with multi-sig? The asset will get 1% of the fees, so this allows for funding of all the requirements to issue the card. 1% on 3% (2 for dev and 1 for asset holders) or 1% of total fees ? Keep in mind there are many pieces being developed in parallel, so my pNXTd framework is independent release schedule of the main BitcoinDarkd. Since mainnet is worth a lot of money, we need to be very careful and methodical with release procedures. I had an idea, about the colors and known memes that could be used for BTCD - what do you think? I like it. Very understated and professional. Nice concept! I think it could be polished up a little bit, but it's a +1 from me. Do we have anyone looking to do logo design for us? Wish I could make something fresh but I'm not a great Graphic Artist.